The ninjas who were guarding the entrance to Village of the Hidden Leaf have been attacked by someone, and Mitsuki has vanished. 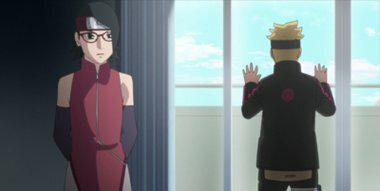 The unknowing Boruto and Sarada visit Mitsuki’s house, where he lives by himself, to pass on a message that a mission that was planned for them has suddenly been cancelled. Having not met him, they grow concerned and begin looking for him. On the way, they meet the Jonin of the village, who have been summoned by the Hokage, and enquires as to what is going on.